I'm so deeply excited about this brand new series on Sown with Strength called "Made with Strength". It will be a Monday collection of stories + heart pieces around motherhood, marriage, relationships, and the beauty of life's messy. To kick it off, we've been given the absolute joy to hear from one of my dearest friends, greatest inspirations, and a true role model to me in motherhood (even though I'm not a mother yet). She makes me WANT to be a Proverbs 31 woman, a woman of grace and an incredible mother... she is this woman. I was blessed to work with her for about a year as the co-coordinators for our church's children's ministry. Read her story, and follow along her everyday love story with her three on Instagram @boysteriousliving. Motherhood has surprised me. I was unprepared for the exhaustion, constant feeling of inadequacy, the drain of emotional energy and the consistency of it all. 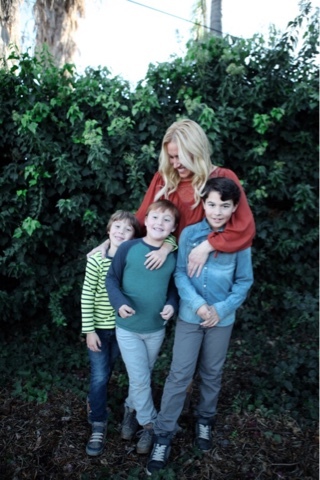 My romantic notion of being a mom and having a handle on it all was hijacked by the reality that as mommas we give all our time, every possible sacrifice, and each day to the needs of our children. Thinking I had it under control began to feel like a foreign concept, much like peeing alone and wearing clothes without traces of (food, spit-up, or dirt) on them. Since becoming a mom my need for time with God has done a major sky rocket which does not align well with the major decline of space for this or any resemblance of slowing or solitude. Most days seems like a blur of unhinged and frantic moments where I am looking for my keys, my cell phone and my children’s shoes all at the same time. There are some mornings when I feel myself coming apart even before our first bowl of cereal. We all sit around the table, scrambling and there I am trying to do a devotional with my boys because they need time with Jesus and really, I need this time with Jesus. My boys are wiggly in their seats and seem inattentive and here I beg God for just a moment of stillness. Against all frustrations and in great need I reach out and God reaches back with truth. I read and we pray and for a brief but beautiful moment I find God. Im sure you've been here…highly un-showered because what mom has 15 minutes to herself, reaching new levels of tiredness because your children are convincingly allergic to sleep and trying desperately not to get swallowed up by the crazy that surrounds you. But what if…in all this sacred chaos we invited Jesus in and allowed Him to pull up a seat to the three ringed circus. What if we laid down our broken expectations of life slowing and life perfecting and just accepted that God finds us and meets us right where we are-with our overflowing laundry and the melting down child. What if we found God in the extraordinary sacred ordinary of our need. There are a lot of days when I have a growing suspicion that I am grossly inadequate for my own life. I recognize my struggle and then assume that it must indicate some sort of deficit in me. But what I am discovering is that this idea of not measuring up is honest, it is real and actually it is exactly where God wants me. The truth is motherhood has ripped me wide open. Daily it exposes all the ways I am messing up and getting it wrong. I am grossly aware of my lack and feel incapable countless times in each day. But more than anything motherhood has revealed to me my great need for God. When I am faced with the inescapable nature of my need I am reminded that God can only begin where I end. Do you hear that momma? Need is a good thing. Not only is it a good thing but it is the very nature in which we were created. God created us to dependent on Him-isn’t this freeing? That means that we can resist the mom temptations to have it all together and hold it all together. We can let go of the control we never actually had and we can fall apart in the whirlwind and we can fall open to God. When we courageously extend our need and dependency in Gods direction He carries us into broad grace and in that moment we can have a profound sense that we are loved and that we don't have to be enough because God is. There are many days in motherhood when I close my eyes for a brief moment to escape from the reality of bickering brothers and a sink full of dishes. If I’m not careful, I can walk around feeling detached from my children and sometimes my temptation to check out is stronger than my inclination to checkin. Have you ever done this momma? Ever tried to flee from the gasping need you’er experiencing? The feeling that we are failing is hard. But what if the beauty of the full facet of these moments was about moving towards our children and God moving into us. What if God was allowing these days because He desires us and longs for us to draw close to HIm. What if, instead of detaching from our exhausting reality we attached to God and His love and grace and called ourselves into His presence. I know that the days are long and loud and we can feel so alone and frustrated but Jesus is inviting us to share in these moments. God invites us to live and move and have our motherhood journey in Him. To be caught up fully in this movement of God we must embrace a posture of openness. Openness to our need for Jesus, openness to dependency on Him, openness to receive His grace. When we open our heart and our mess and our need to God He enters in and dwells with us here. Motherhood is filled with surprises. But more than anything it is filled with invitations to draw close to God and offer our need to the One who desires to do motherhood with us. By the grace of God we are not alone. We are not alone in this feeling of failure or struggle. We are not alone in the weight of our lack or inadequacies. We are not alone in the joys or the pains of this sacred calling. Motherhood is a sacred calling into dependency. A calling into relationship with God. What if our need was a battle cry to God. Momma you are loved. You are infinitely valuable. Your need for God is good. His love language is grace and His name is, God with us. What if you welcomed Him into your need and folded your motherhood story in His.